The views from this Early Christian site are really stunning. 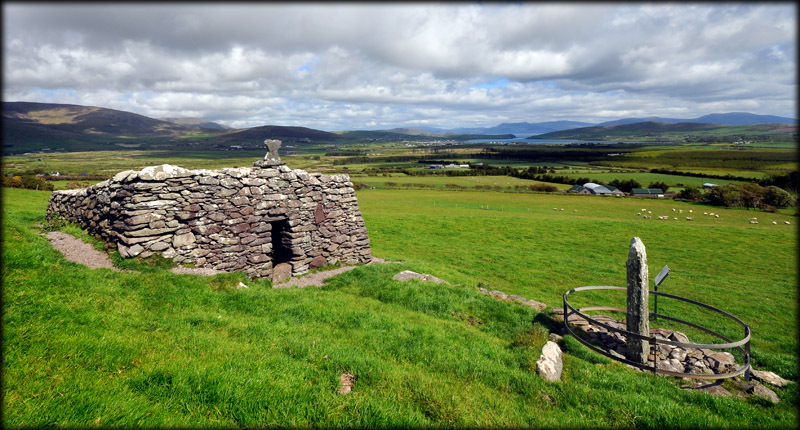 The oratory is built on a man-made platform on the south eastern side of Lateevemore Hill overlooking Dingle Harbour. To the east you can see Mount Brandon, and the Skelligs can be seen to the west. Temple Geal means bright church. 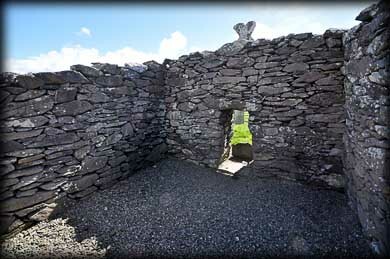 The boat shaped oratory is similar to the one at Gallarus. Standing at a height of 2.75 metres in places this dry stone structure was dedicated to St Manchan. Built into the wall above the lintelled doorway is a finial that came from the top of the west gable. Queniloci is a male name and Maqi is Son of ............ The cross is inscribed on the west face. Also present at the site is the remains of a small burial ground with several cross inscribed slabs and boulders. In the same field to the west of the oratory is a souterrain. If you wish to get away from the crowds of tourists visiting the Dingle peninsula we strongly recommend the short ramble to Ballymorereagh. One of the cross pillars, the west face of the ogham stone and the lintelled entrance to the oratory with the finial. 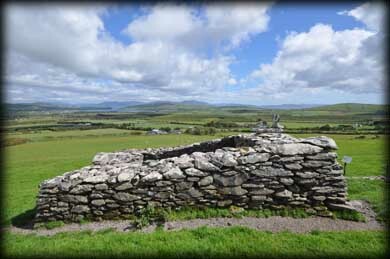 Situated: From Ventry head north passed the post office. Turn right at the T-junction. Then after 1.4 K turn left (easy to miss). Go to the end of here and park at the farm. Walk to the end of the track and go left through the gate. Discovery Map 70: Q 4047 0284. Last visit May 2013.